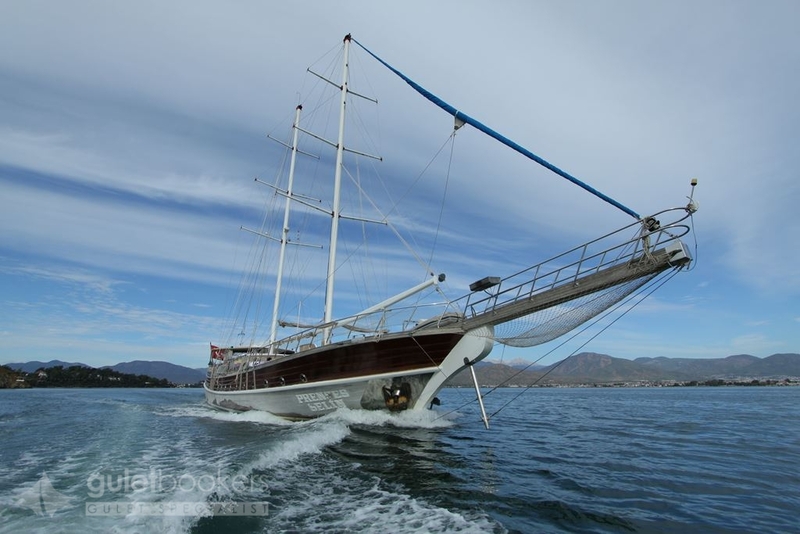 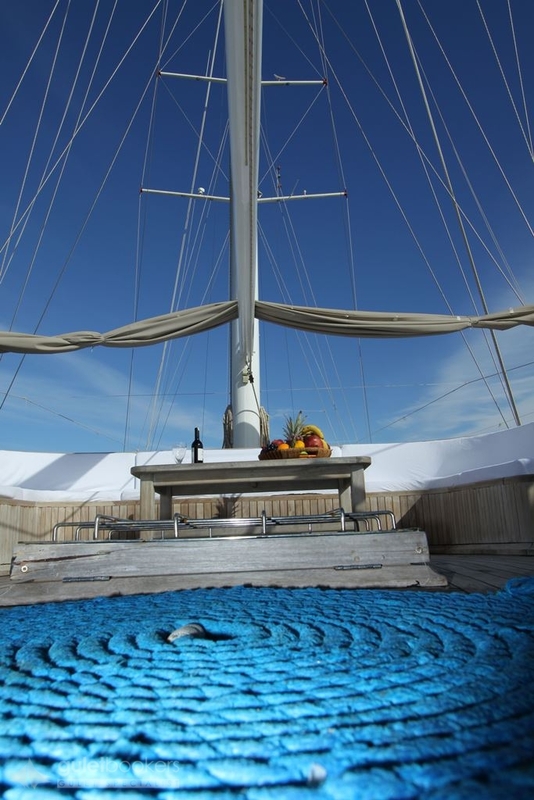 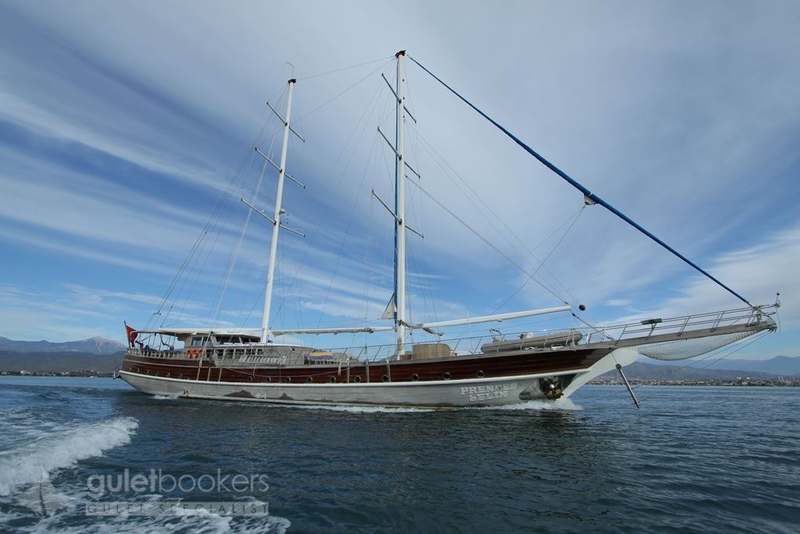 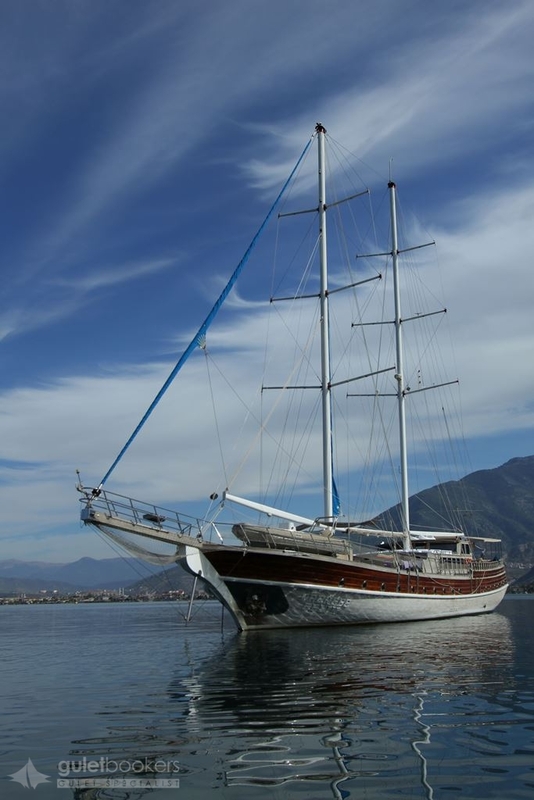 The 35 metre luxury gulet yacht Prenses Selin is the spacious and ideal size gulet for a large group or family of up to 20, who want a good standard of design, comfort, space and value for their gulet charter on the Turkish Riviera coast. 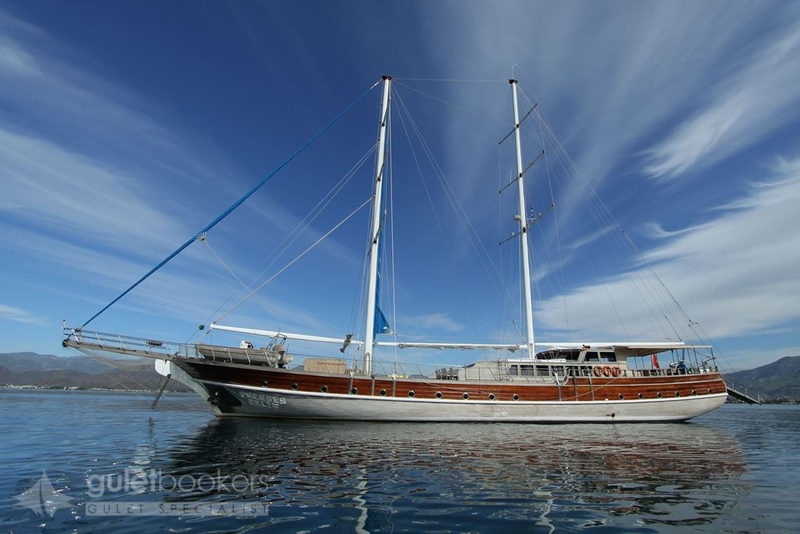 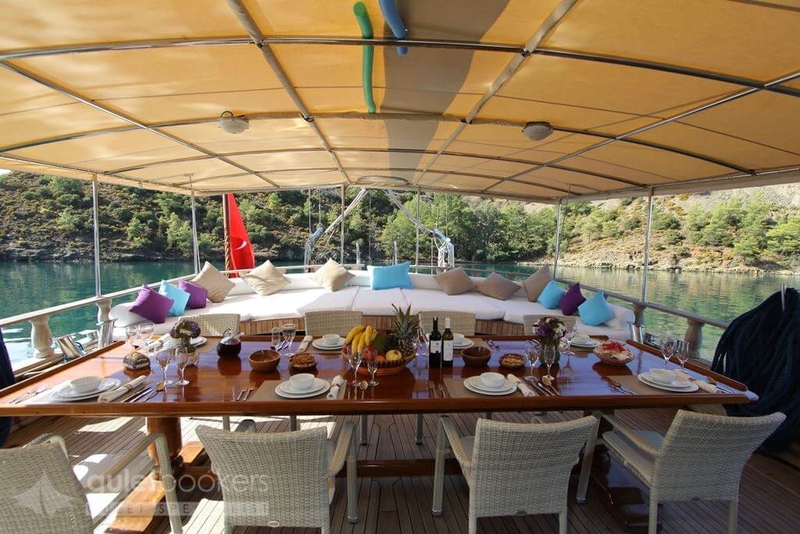 The group on Turkish gulet Prenses Selin will enjoy their classic crewed boat charter holiday in nine compact well-appointed cabins with ensuite bathrooms and air-conditioning to ensure all guests enjoy comfort; seven cabins are double and two are are double bed+ single bed cabins. 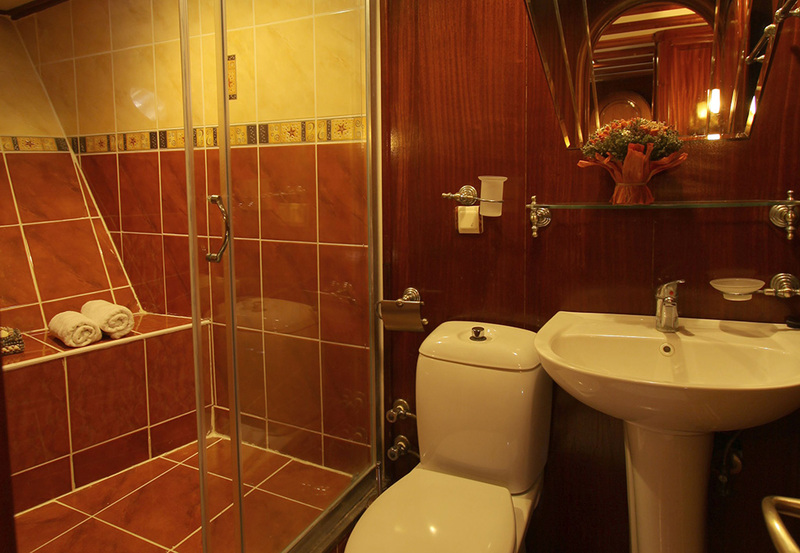 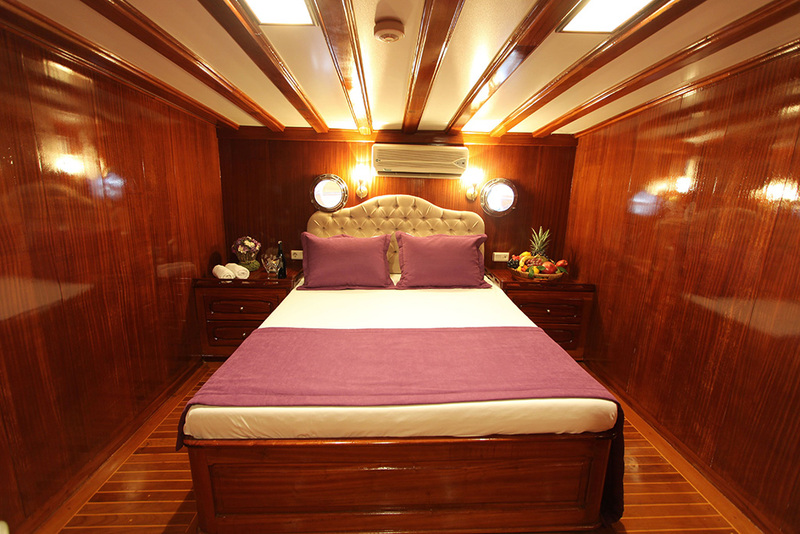 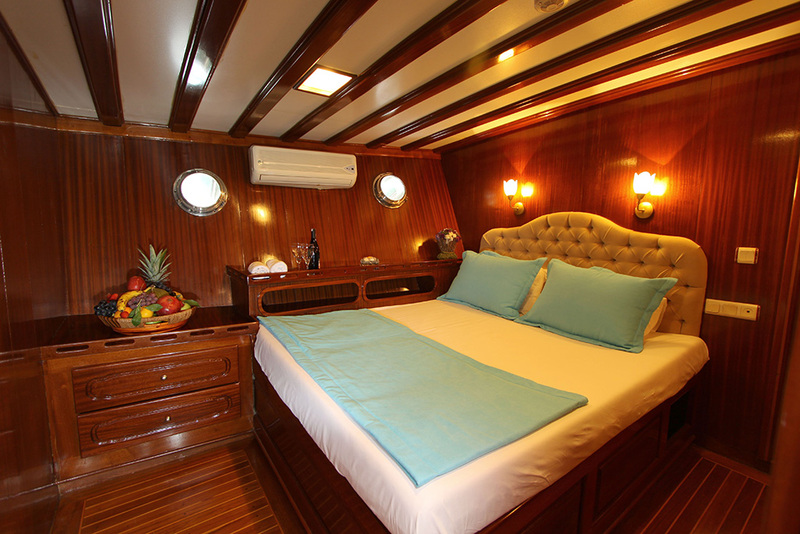 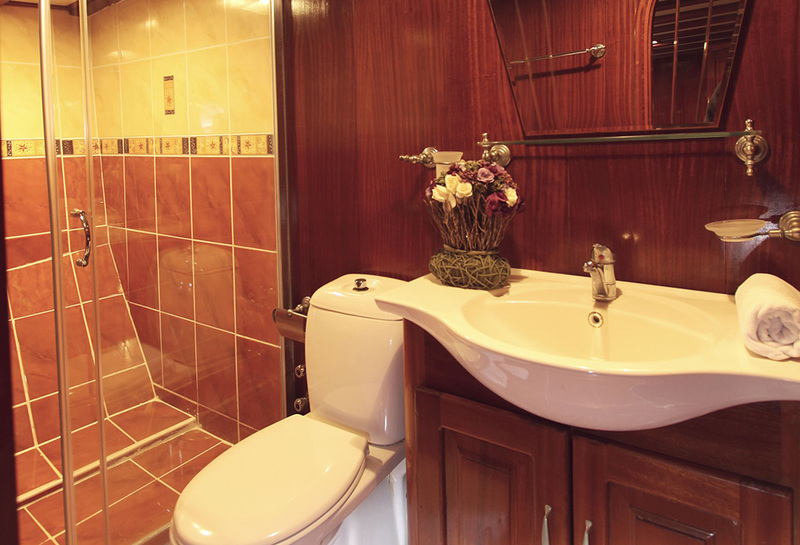 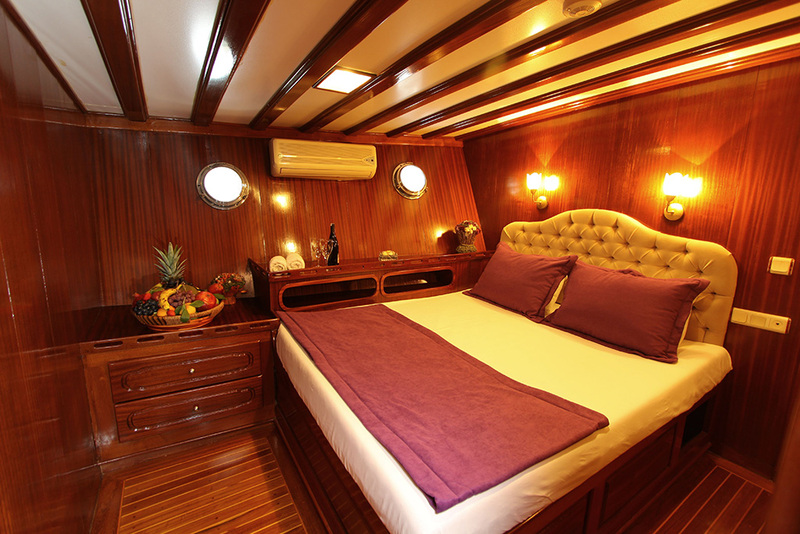 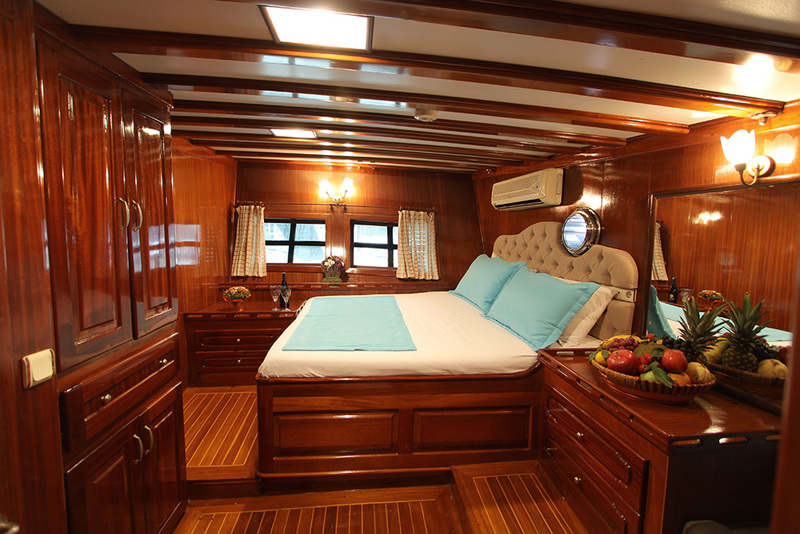 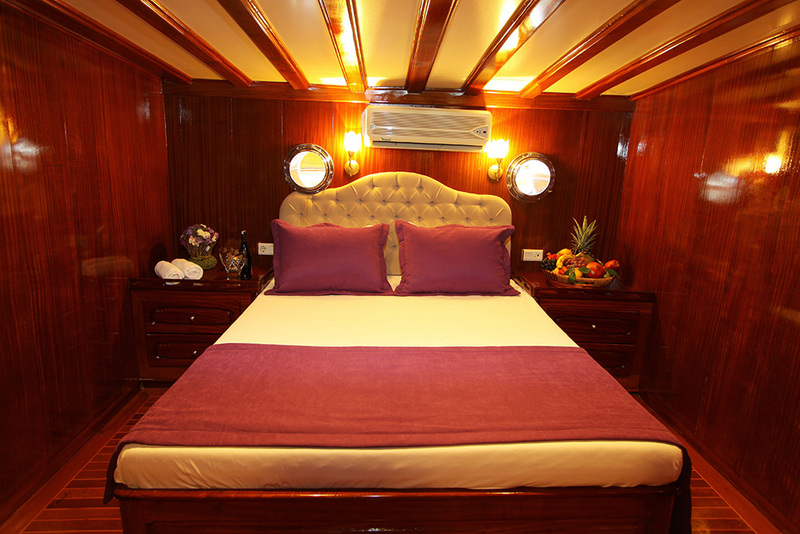 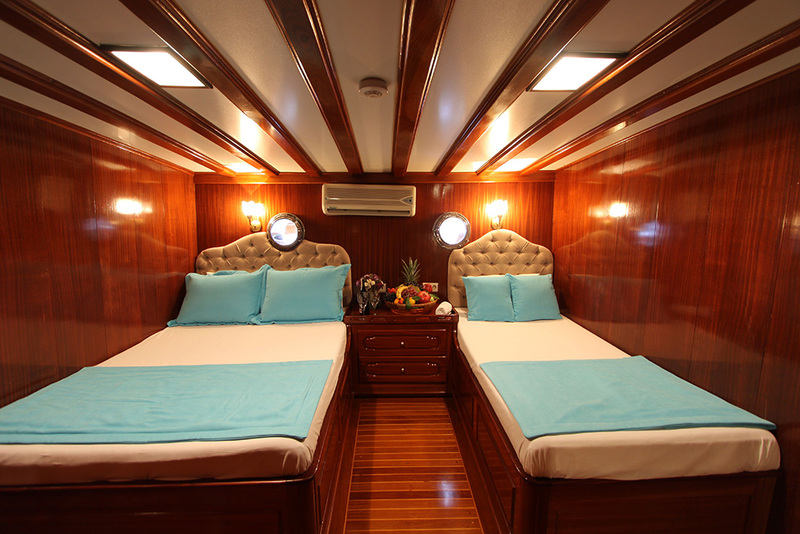 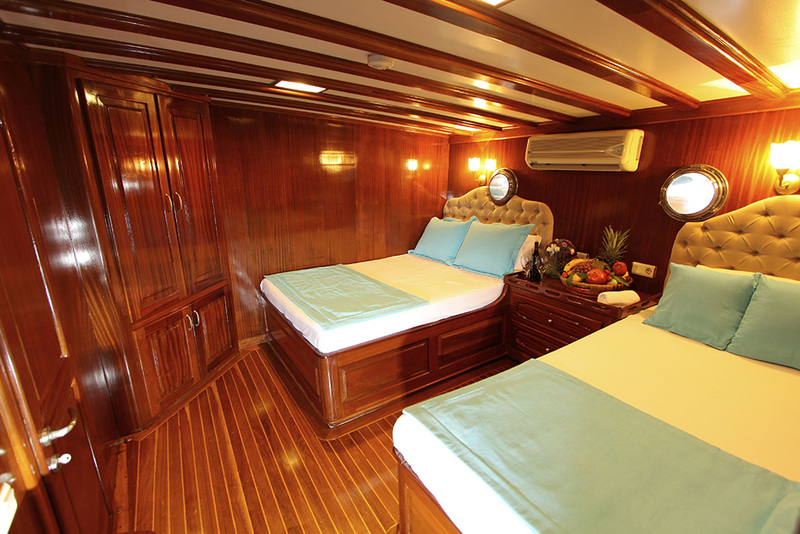 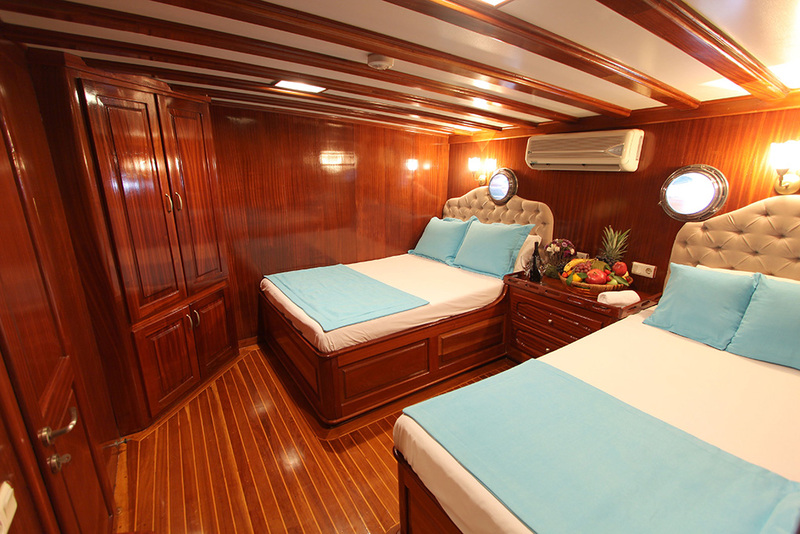 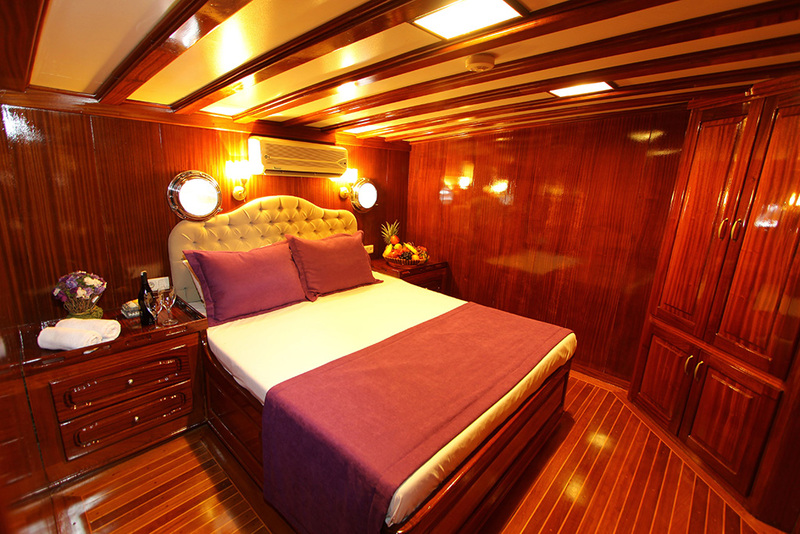 The two aft double bed cabins are the largest with a small seat to the side. 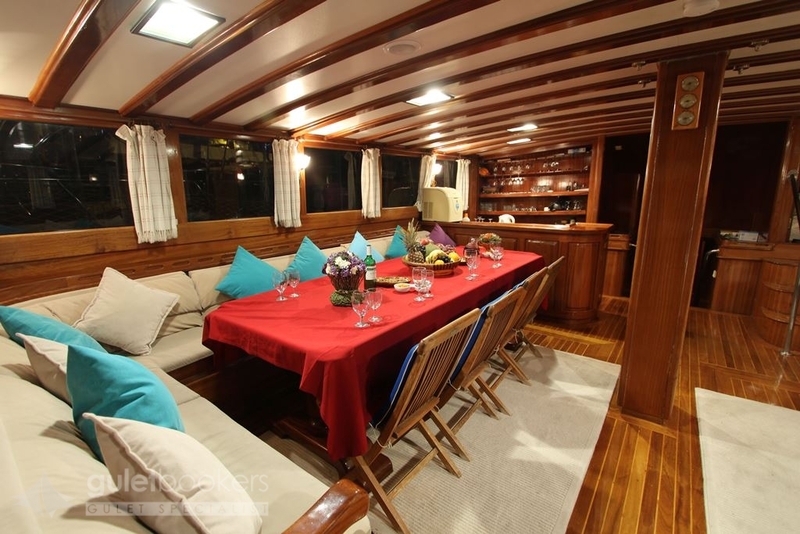 The spacious communal air-conditioned saloon affords both the third large dining table, and more comfortable banquette seating where the TV/DVD and music system can be enjoyed. 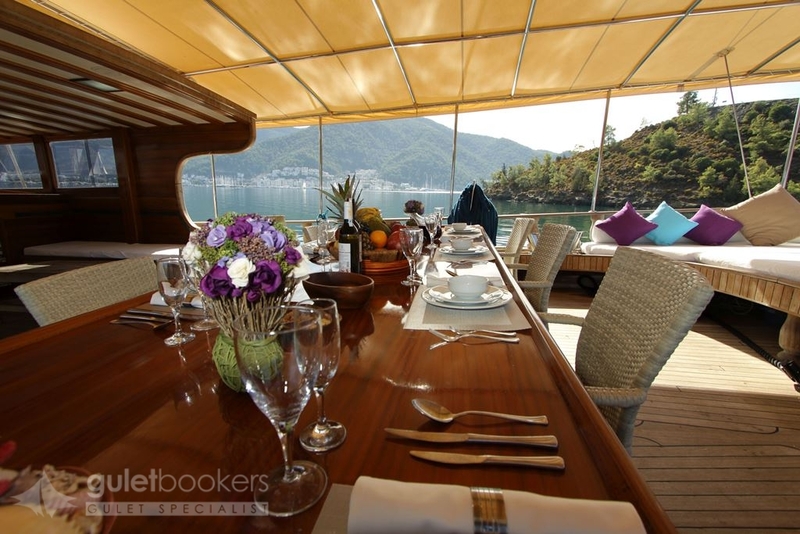 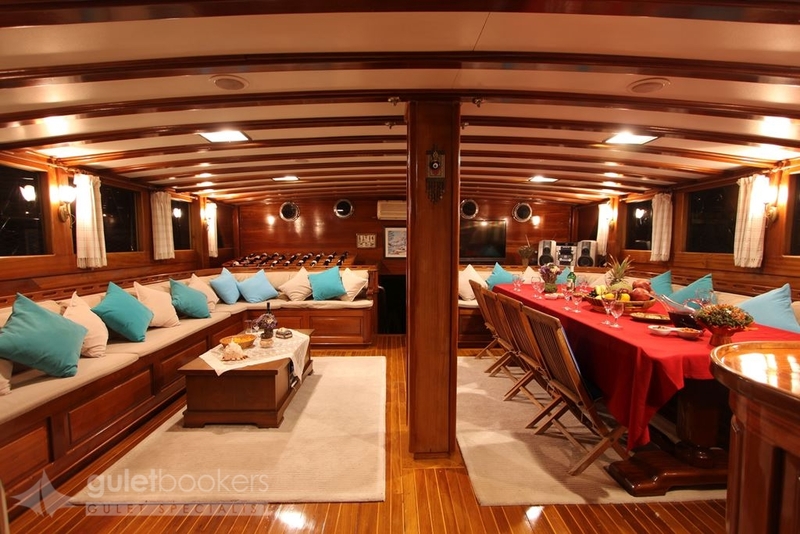 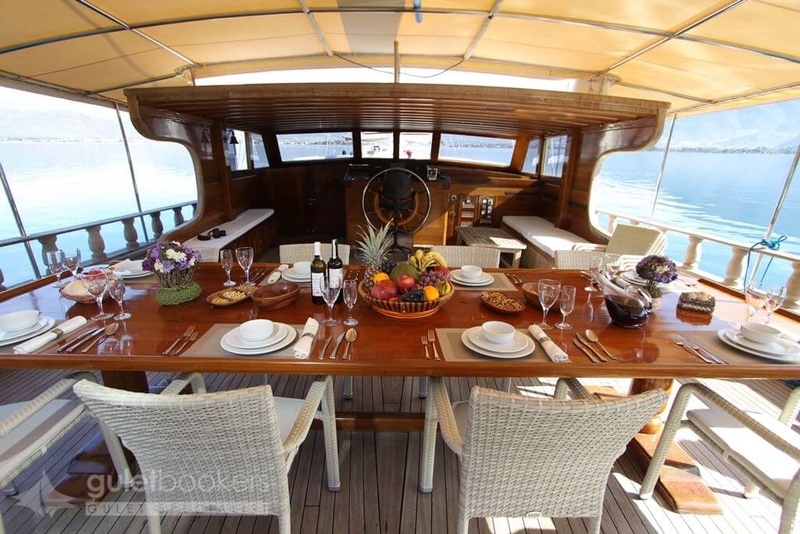 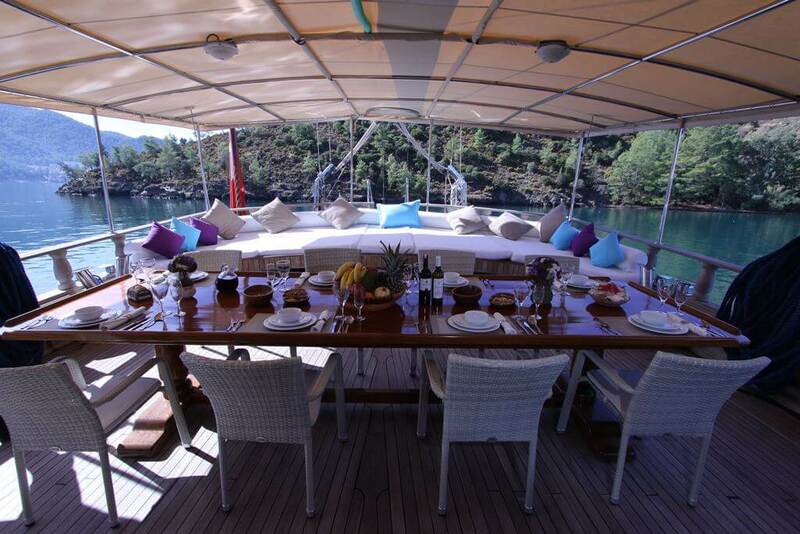 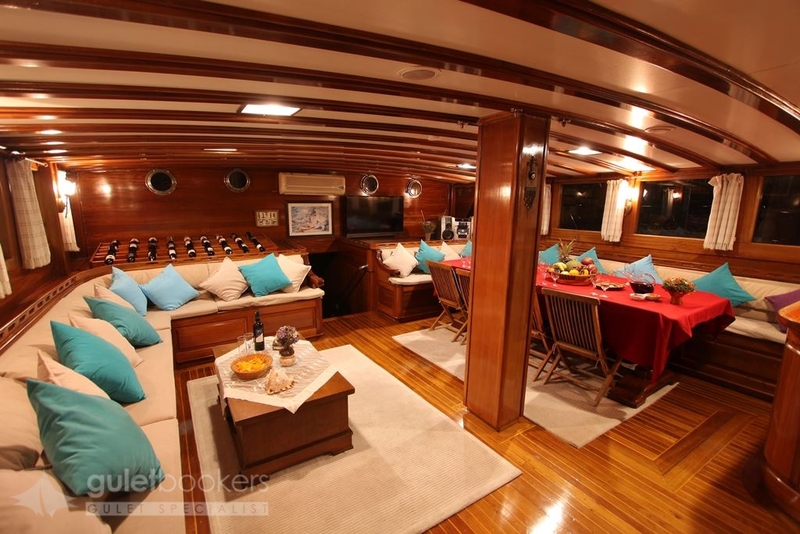 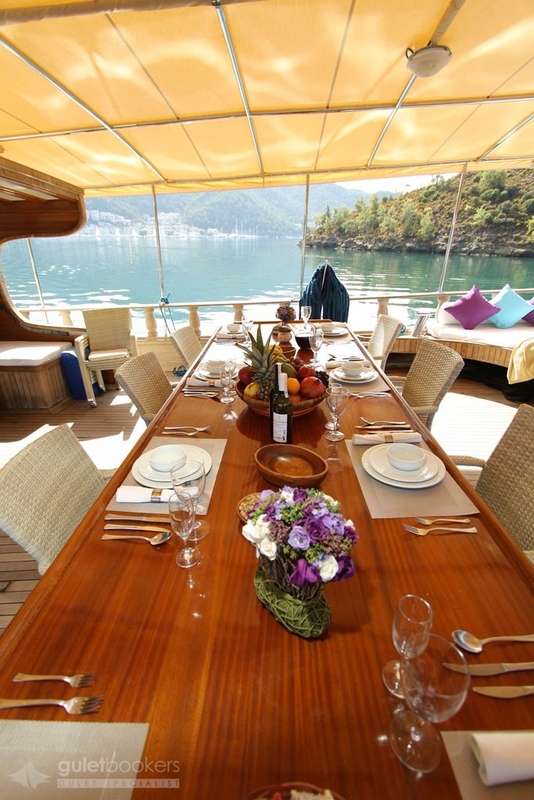 On the single level open deck of yacht Prenses Selin , there is space galore with two large dining tables fore and aft under the awning. 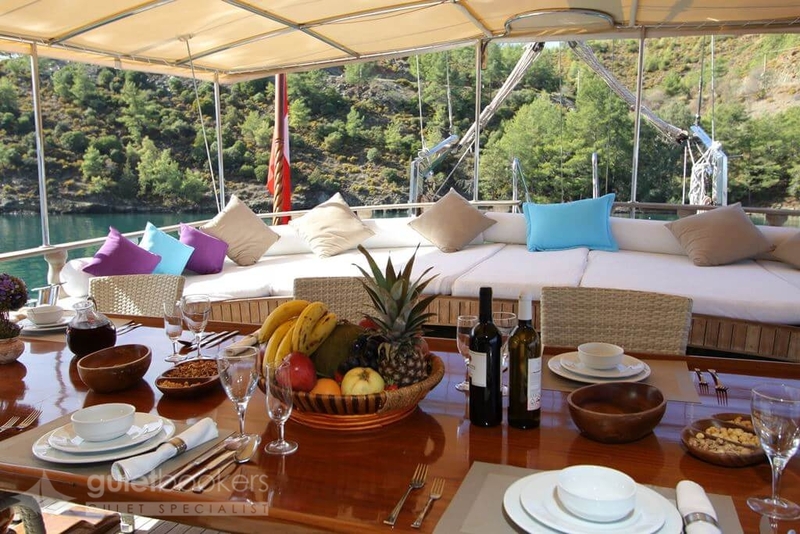 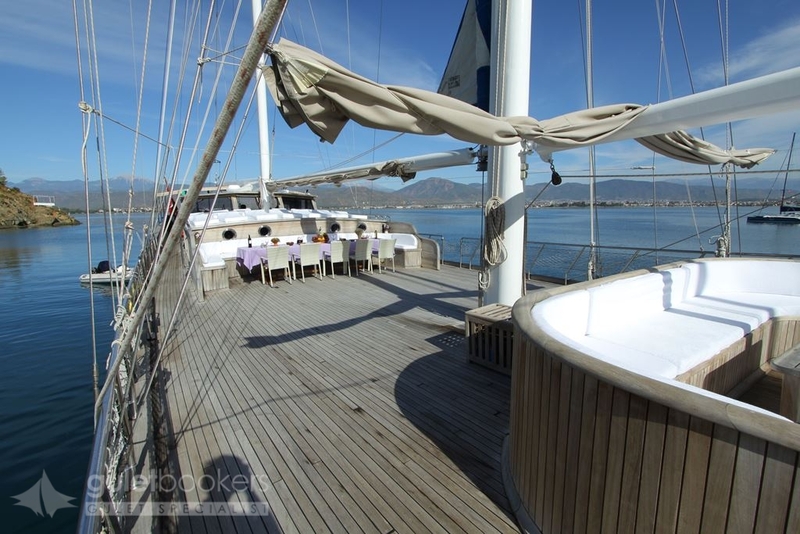 Bean bags provide lounging abound on the deck, and personal sunbeds are laid out on the raised foredeck accessed by ladders, while a fixed shade awning aft provides a pleasant retreat on cushions across the stern. 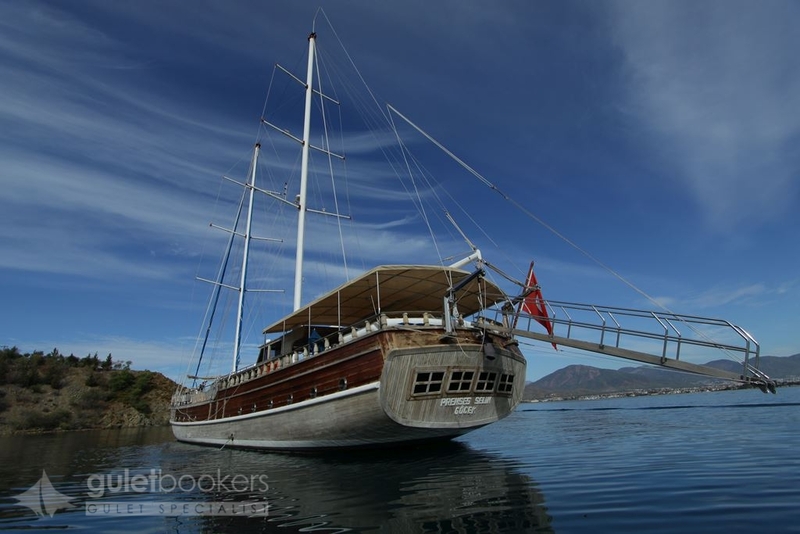 The crew on this gulet cruise go out to make it special, assisting with the canoes and snorkels, and the extra water toys, to make every anchorage a playground. 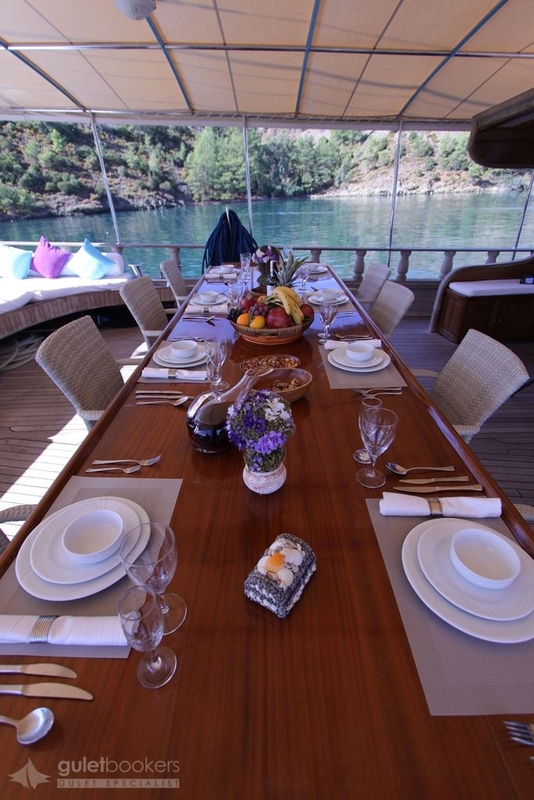 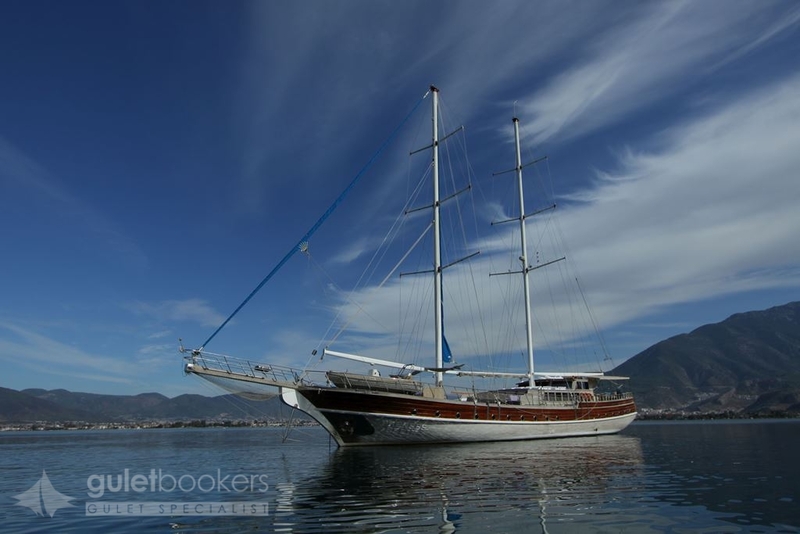 The crew of Prenses Selin, the captain, cook and two sailors will make sure you have a memorable gulet holiday along the Turkish coast, or island hopping in the nearby Greek Islands.